You can access the Agent Roster Link settings by clicking Account in the main menu, Users in the submenu, then Agents. Find the agent you would like to update and click on the Edit icon in the Tools column. On the Edit Agent page, click Roster in the tab menu. On this page are settings for the display of this agent's information in your Roster page. Redirect to Personal Website - This preference will send all links from the Agent Roster page directly to the Agent's personal website URL, as entered into the Website URL field, instead of the IDX Bio page. Enable Clickable Link on Roster - Allows site visitors to click from the agent's bio page directly to their own personal website, after viewing the system provided bio page that displays all of the agent's current listings. 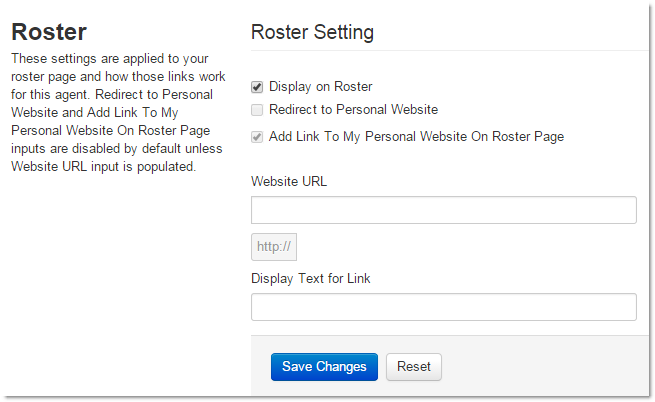 Display on Roster - Check this box to display the agent's link on the roster page. In order for the settings above to work correctly, there must be a link added to the Website URL field as this feature handles these outside links for agents. NOTE: Make sure you put the entire path of your website, including the "http://". Also, if you do not like the system default display for the link text on the agent's bio page, you can enter in your personalized text in the Display Text for Link box.